Meanwhile, place 1 tablespoon of the melted butter in a large skillet over medium heat. Add the onion and celery, salt and pepper. Cook, stirring, about 10 minutes. Stir in the herbs and cook 1 more minute. Remove from heat and stir in the rice, pecans, cranberries, and 1 teaspoon salt and pepper to taste. 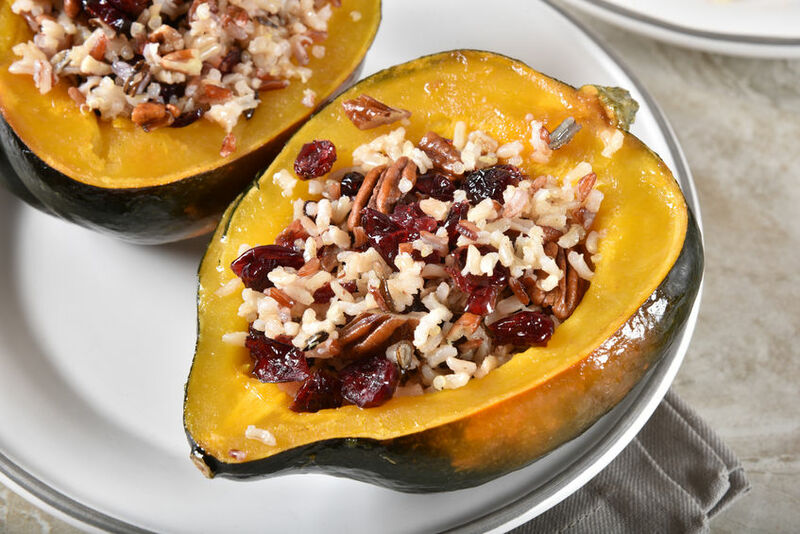 Divide the rice filling among the roasted squash halves and drizzle the remaining tablespoon of butter over the top. Bake until the squash is completely tender and browning up and the filling is heated through, about 25 minutes. *To cook wild rice: combine 1 cup wild rice with 4 cups water and 1/2 teaspoon sea salt. Bring to a boil, lower heat, cover, and cook for 45 minutes. Drain any remaining water.